French environmental services firm, SUEZ has had its 10 year, €54 million contract to design, modify and operate the Shatin Transfer Station in Hong Kong renewed. The company explained that the Shatin Transfer Station currently has a design throughput of 1200 tonnes per day of municipal solid waste collected from urban population centres for onward transportation to North East New Territories Landfill. Under the new contract, SUEZ said that it is responsible for the design, modifications and operation of the Station. This includes construction and design work to modify existing facilities, maintenance work, and the replacement of machinery as needed to meet the expanded maximum throughput of 50,000 tonnes per month. The company added that it is responsible for operating the Station to very high environmental standards – ensuring disposal of permitted waste at designated or alternative landfills. Throughout construction works and operations, SUEZ will also perform environmental monitoring and take measures to mitigate the environmental impact of facilities. SUEZ noted that it has been active in Hong Kong for more than 28 years and currently operates six out of seven transfer stations contracts and two of the biggest and most modern landfills in the world that treat almost 3.8 million tonnes of waste per year. It also manages the restoration, aftercare and after-use of seven closed landfill sites in Hong Kong. The company added that it is currently responsible for treating 70% of the waste of the city’s 7.3 million residents. Green groups fear government waste reduction targets for 2022 could be heading for the bin as new data once again reveals more rubbish was dumped in the city’s landfills last year. An average of 14,859 tonnes of solid waste was discarded every day last year, an increase of 3.8 per cent from 2013. It was largely driven by a 10 per cent rise in construction waste, the latest Environmental Protection Department statistics show. The 2013 rise was 3.4 per cent. The department said the figure had “fallen cumulatively” by 9 per cent over the past decade. The amount of municipal solid waste dumped in landfills increased 2.5 per cent from an average of 9,547 tonnes per day in 2013 to 9,782 tonnes last year. Municipal solid waste, which is general rubbish from the domestic, commercial and industrial sectors – roughly a third of which is food waste – is the biggest component in the city’s rubbish mix, followed by construction and demolition waste. This means that on average a person generated 1.35kg of rubbish a day last year compared with 1.33kg in 2013, 1.3kg in 2012 and 1.27kg in 2011. Ho said the only policy that would help lower waste drastically was a municipal solid waste charge. Legislation implementing such a charge was initially slated for next year, but the government has yet to table the relevant legislation. World Green Organisation senior manager Angus Wong Chun-yin said even if a waste charge system was approved next year, the scheme would not come into full effect until 2018 or 2019 at the earliest. Wong said one positive sign was that the quantity of food waste was not going up too much. He urged the government to provide more financial support to food recyclers and surplus food collectors. The recycling rate stood at 37 per cent last year, with the total recovered quantity of recyclable materials rising by 45,000 tonnes over the previous year. More ferrous metals were recovered, but the collection of paper and plastic waste dropped by 87,000 and 144,000 tonnes respectively. 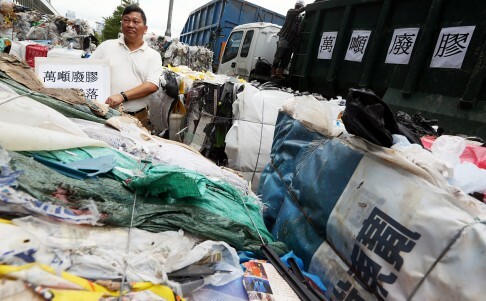 A department spokesman said measures had been introduced to support the recycling industry, including the HK$1 billion Recycling Fund launched earlier this month. (28 October 2015, Hong Kong) — Eleven leading green groups have declined the Hong Kong Airport Authority (AA)’s invitation to join the Professional Liaison Group (PLG) for the Three-Runway System Project. Following several months of communication with the Airport, green groups decided that “a more effective and efficient platform for dialogue, and a greater commitment from the Airport Authority and Government on a truly green airport” is required. 4. The absence of an independent due process for the proposed Professional Liaison Group. Green groups noted that the PLG was limited to a technical oversight of the environmental consultant hired to monitor the contractors meeting the various technical conditions set out in the Environmental Permit. The PLG would be controlled by the Airport which act both as Chair and as Secretary. However, no resources were set aside for the Members to conduct their work independently. It was determined that participation would seriously undermine the “watch dog” and “environmental expert” roles of green groups. The green groups who declined the invitation include Clean Air Network, Clear The Air, The Conservancy Association, Designing Hong Kong, Friends of the Earth (HK), Green Lantau Association, Green Sense, Greeners Action, Hong Kong Dolphin Conservation Society, The Hong Kong Bird Watching Society and Living Islands Movement. The report, The potential contribution of waste management to a low carbon economy, was commissioned by Zero Waste Europe, in partnership with Zero Waste France and ACR+ and prepared by Eunomia Research & Consulting’s Ann Ballinger and Dominic Hogg. It’s key finding is that the role waste prevention and improved waste management can play in reducing GHG emissions and the development of a low carbon economy has previously been significantly understated. ZWE noted that in December, delegates from across the world will gather in Paris to negotiate a new climate agreement aimed at replacing the Kyoto Protocol. The parties to the United Nation Framework Convention on Climate Change (UNFCCC) are progressively publishing their pledges in terms of GHG reductions which are supposed to limit global warming to under 2°C. Among the many possible climate change mitigation solutions that are emphasised, according to the report’s authors, one that is consistently underestimated is the significance of waste management strategies. One reason for this is said to be that the ‘waste’ section of the national inventories to the UNFCCC does not take into account most of the emissions from this sector. Emissions reported under this section mainly concern methane emissions from landfills. All the emissions related to the transport of waste and incineration with energy recovery are respectively reported under the transport and energy sections. According to Zero Waste Europe (ZWE), the report also provides an accurate examination of the true impact of waste management on climate change and carbon emissions. It confirms that actions at the top of the waste hierarchy – including waste prevention initiatives, reuse and recycling – have considerable scope to reduce climate change emissions. It is stated in the report that: “A climate friendly strategy, as regards materials and waste, will be one in which materials are continually cycling through the economy, and where the leakage of materials into residual waste treatments is minimised”. For example, recycling 1 tonne of plastic packaging can be a saving of 500 kg CO2 eq, whereas using one tonne less plastic packaging results in avoiding 6 times more emissions (3 tonnes CO2 eq). The authors make 11 key recommendations, calling for waste policies to be redesigned in order to prioritise the higher level options of the ‘Waste Hierarchy’ (waste prevention, reuse and recycling) and immediately reallocate climate finance subsidies which are currently supporting energy generation from waste. These recommendations put a strong focus on correcting methodological issues that are currently preventing Member states and the European union from implementing waste policies that are efficient in terms of GHG emissions. The report said that in the decarbonising economy required to mitigate the worst impacts of climate change, technologies such as incineration will become less attractive options and ultimately present an obstacle to a low carbon economy. “Efficiency and smart waste management is key for a low carbon economy. Still, it is only the tip of the iceberg as a much bigger impact can be achieved through resource efficiency and adopting a life-cycle perspective”. A project aimed at developing a robotic manipulation system capable of handling millions of cubic metres of unsorted radioactive waste has been awarded €6.4 million by the European commission. The circular economy is about much more than recycling and landfill. As Accenture’s Peter Lacy argues, businesses and consumers need governments to reward innovation through effective incentives. Waste is at the heart of the way the world does business. We take, we make and we discard waste. As countries run up against scarce resources and pollution, many governments have acted swiftly to reduce waste. But policymakers’ view of waste is often out of date and this risks missing the massive economic opportunity that waste now presents. The emergence of the circular economy calls for a total redefinition of waste and promises $4.5trn in unlocked growth. The traditional approach to managing waste has come down to recycling and managing landfill. Other curbs have improved the efficient use of natural resources. But what about the wasted capacity in the cars that stand idle for 90% of the day? Or the wasted lifecycles as products are discarded after their first use? And what about the wasted embedded value that could be eliminated by repurposing materials? Or the wasted resources that could be reduced through renewable energy and materials? This four-dimensional appreciation of waste forms the foundation of the circular economy that not only mitigates environmental damage but significantly reduces business costs and generates new revenue streams. Governments will be crucial to its success. Let’s be clear that policy won’t be the only force driving the circular economy. Price already is transforming investments. For 40 years until the turn of the millennium, commodity prices decreased as growth surged. But this pattern then reversed dramatically as the rise of urban populations and middle class consumption led to intense shortages of many resources while putting others such as water and fertile soil under great stress. In recent years, prices have skyrocketed and crashed dramatically. Businesses now feel the pain of unpredictable resource supplies and price volatility. Prices for metals like copper, iron, tin and nickel, have nearly doubled between 2000 and 2015. Despite the recent falls, the real price of oil in August 2015 was 55% higher than in August 2000. Businesses have no choice but to respond to such cost increases. To this end, many welcome the European Commission’s treatment of its new circular economy proposals as primarily an economic package – with fantastic environmental side effects. After all, for every percentage point reduction in EU resource use could be worth around €23bn to business and could result in 100,000 to 200,000 new jobs, according to Potočnik. In order to address waste across all its four dimensions, the priority for governments is to redesign regulations to encourage new consumer and business behaviours. That includes levelling the playing field between today’s linear models of take-make-waste and circular models. The financial attraction of growing through greater consumption of resources needs to be reduced. Companies must be encouraged to incorporate the cost of environmental impact into product pricing. There is also a need to shift regulatory efforts from managing waste and landfill to pursuing a zero waste economy in the first place. That can include measures to stimulate demand for more resource efficient products through greater transparency on resource composition (through minimum packaging standards, for example). But as much effort is required on the supply side. An improvement in the availability of information on waste and materials, reinforced by international standards, would help. Countries could follow the example of the WRAP initiative that helps all stakeholders use resources more efficiently. Extended Product Responsibility (EPR) policies can be used to make producers responsible for what happens to products after they have been consumed. Studies still show that collective responsibly for disposal is not as effective as making each manufacturer responsible for its own branded goods. Taxation must be adjusted to back up new regulations. At a broad level, the imbalance between labour and resource taxation needs to be addressed. While commodities look set to be scarcer and more expensive, labour is likely to be cheaper and more plentiful. So a shift in the burden of taxation from labour to resource consumption could have the dual-benefit of creating jobs and encouraging efficiency. The International Labour Organization thinks that if a global tax on CO2 emissions were imposed (and the revenues used to cut taxes on labor) around 14 million jobs could be created. Taxation and policy should be consciously designed to support the emerging business models that will underpin the circular economy. For example, sharing platforms that make use of underutilized property, vehicles and other assets. 60% of truck capacity in the EU runs empty. Regulation could encourage commercial opportunities to turn that waste into revenue. Product-as-a-service models likewise encourage providers of products to maintain them for longer. The recovery of waste is a nascent market today and requires incentives that help companies transform the behaviours of supply chains to ensure the quality of repurposed waste is sufficient for re-use. Government can also transform supply chains through more stringent demands in public procurement which represents a large proportion of consumption in many countries. As the ‘take, make, waste’ economy runs up against scarce raw materials, market prices will encourage businesses and consumers to change their behaviours. Technology will also unleash new circular models. By seeing waste as an opportunity for competitiveness and growth, Governments will be better placed to implement wide reaching policies that will give their economies an even greater circular advantage. Peter Lacy is managing director of Accenture Sustainability Services and co-author of Waste to Wealth: the Circular Economy Advantage.